The government recently released data showing that fire protection is one area of employment where job injuries have been on the decline. According the research, the rate of injuries for fire protection employees fell from 13.5 to 11.2 cases per 100 employees. There are several factors being cited for this accomplishment, including new fire codes, higher levels of public awareness that reduce fires overall, and better suppression systems. In addition, fire station managers have been more focused on safety, providing training and education about staying side around the clock. Some of the most common injuries for firefighters happen when they move heavy equipment out into the field. Since firefighters have to quickly move heavy equipment from the station to other sites, strains and sprains are the most common form of injury. Overexertion from the physical labor of working in hot environments also tends to be a common issue with fire protection employees. Despite improvements, some fire protection experts believe that the government has plateaued with reductions in fire safety. It would be great if every industry invested as much concern over the safety of its workforce. The fire protection industry deserves praise for this. Where Do Other Jobs Come In? Like fire protection, jobs in utilities also seemed to be on the decline for employee injuries and illnesses that caused workers to miss days of work. Nationally, rates for injury on the job in government occupations seems to have leveled off. 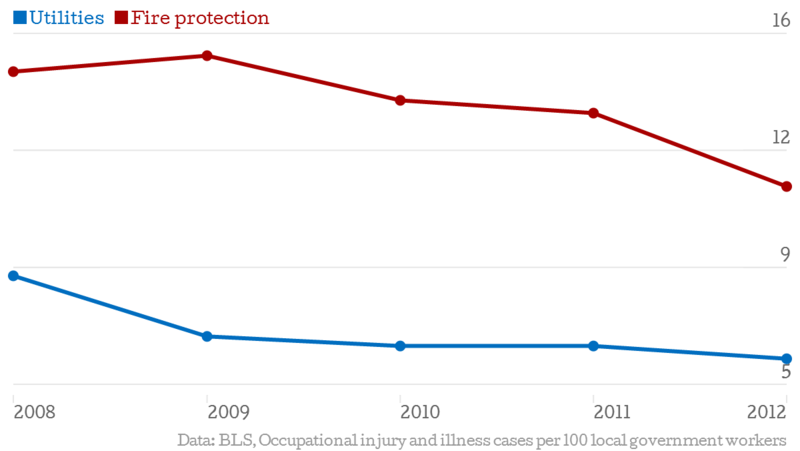 For the last three years, overall illness and injury rates have stayed mostly the same at 6.1 cases per 100 workers. At the state level, very little has changed as well. Utilities and fire protection are typically two of the most “dangerous” types of government occupations since their illness and injury rates have often been the highest. Public transportation employees face a much higher risk of being injured on the job than individuals employed in private transportation operations. Fire personnel, police, and public hospital employees are some of the other workers who face a higher risk on the job when compared to their private counterparts. For reporting of injuries in government jobs, injuries made up the majority of claims, running the gamut from minor slips to critical vehicle accidents. Even in areas where an industry is known for having high job risk to start with, government rates of injury seem to me higher than similar industries in the private sector. In 2012, local and state governments reported over 790,000 work-related injury incidents, nearly half of which led to transfers, missed work days, or job restrictions. In comparing local governments with the private sector, six of the seven subsector industries with comparable data showed that local governments had higher rates of accidents when compared with the private sector. One example of this is private and secondary education employees. In the public sector, these employees were injured or became ill with a rate of 5.2 per 100, while the rate in the private sector was only 2.8 per 100. In transportation, public employees registered illness or injuries at a rate of 7.1 cases out of every 100, but private sector employees only did so as a rate of 5.1 per 100. When state government data was reviewed, too, public sector employees always had a higher rate of injury. Some industries, like fire protection or police, are no surprise when included on a list with high job injury risk. What research found, however, is that state-operated residential care and nursing facilities had the highest illness and injury rate of all industries. 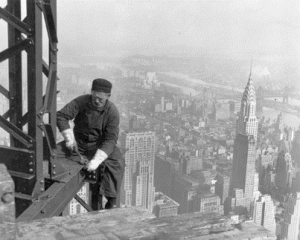 Some of the most common incidents for these employees were blood and bodily fluid splashes, needle punctures, and slip and fall accidents. One such way to cut down on these type of incidents is for employees to be highly educated about protective measures and to always wear protective gear. Employers maintain a responsibility for a safe workplace where protection is promoted. Given that many injuries for government employees included falls and overexertion, it’s clear that even more could be done to help reduce the number of injuries and missed work days associated with federal, state, and local government employees. Of course, the kinds of injuries that affect government employees and private sector employees depend greatly on the type of work being done. On average, local government employees missed a median of 8 work days in 2011. Some of the most common injuries for government employees were tears, sprains, and strains, typically the result of overexertion of falls. Overexertion and falls had the highest rates of employee injury across the board, followed by contact with an object or equipment, violence from a person or animal, and transportation accidents. If you were seriously injured in a work related incident due to neglect of safety measures being implemented and followed in the place of business, you are due compensation for your injuries, pain and suffering. Consult with the Burn Injury Firm … attorneys who know how to bring justice to employers who risk the lives or workers, causing preventable injury.